Instagram is one of the platforms I LOVE most -- and that is, in large part, due to Instagram Stories! Instagram Stories bring community and friendship to the platform. It allows us to connect on a more human and personal level and brings the intimacy of the creative practice right into the hearts and minds of our audience. In this podcast I offer 5 tips for using this platform really well. Download the guide here. Can artists make it on their own? I mean, really. We are supposed to be dependent on others and suffering and starving... but no. Nope. I'm having none of that. In this episode, we get into the mindset shifts needed to create a sustainable creative career. Visit EmilyJeffordsLearn.com to find out more about the podcast, Emily Jeffords, and Making Art Work. Enrollment will reopen in early 2020. Making Art Work is OPEN! Visit EmilyJeffordsLearn.com to learn more and to JOIN US! Your ability to edit photos on the go has NEVER been easier -- but which apps to use? I list my 5 favorite apps, reasons I chose them, and tips to use them well for your own photos! Join me in a 5-part VIDEO series, The Studio Series! This is a mini-course designed to bring clarity & inspiration and to your creative practice. Join us! The course launched TODAY and will available through the 27th of March! 8: Can Artists Really Sell Artwork Online? Can artists actually sell artwork online? Really...? BROUGHT TO YOU BY MY UPCOMING COURSE: Making Art Work -- a 3 month, 12-week intensive course and community for artists and creatives wanting to grow their creative practice into a thriving, sustainable business. 5 books that are changing the way I think about marketing, the creative process, and WHY I chose to lead this beautiful, complex, vibrant lifestyle. I hope they encourage and inspire you as well! What makes some Instagram accounts come ALIVE? Why do some people seem to have ALL the engagement while your account gets crickets? This episode dives into engagement across the whole Instagram platform and how to really add value to your community. I'm getting a bit nerdy in this episode to bring you ALL the goodness and growth (and the exact method I used to grow my account from 0 to 70,000+). Download the PDF workbook that accompanies this conversation HERE. Have you ever thought about the psychology of an engaging Instagram account? How about the aesthetic flow and community-centered conversation? I'm getting a bit nerdy in this episode to bring you ALL the goodness and growth (and the exact method I used to grow my account from 0 to 70,000+). Get the PDF workbook "Instagram for Creatives" HERE. 4: Mother + Artist: can creativity coexist with parenting? Can creativity live alongside motherhood? We address this question and delve into mindset shifts and practical tips to make this challenging task even more rewarding. "Allow your children to find space within your life --but don’t remove all other loves in the process. Your heart is big enough for all of it." the power of small consistent steps. Creating a practice the keeps your heart and mind far from burnout and deep in your inspiration. 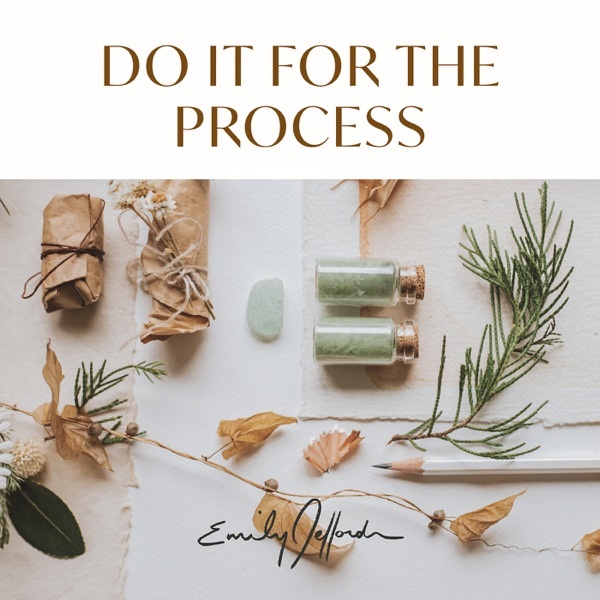 This mantra, "do it for that process", Has deeply inspired my practice and that of thousands of other creators. Download the jet for the process creative practice guide here: "14 Tips for connecting with your creative process." 212 people answered this question openly and honestly on one of my Instagram posts recently. Their replies are deep and heartfelt and DESERVE to be heard. This is a random sampling of some of those comments read aloud. Art is POWERFUL. Art is change. It is grace and peace and pain and passion. Welcome to the studio and to the Do It for the process Podcast. A Podcast for creatives, artists, and those who are creatively curious.